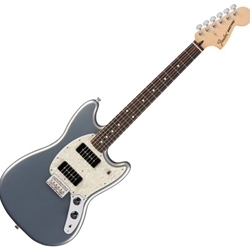 Fender's Mustang 90 solidbody electric guitar reintroduces one of the most popular offset-body styles with some modern updates that are a hit with the new wave of modern guitar players. The Mustang 90's 24" scale length keeps string tension low and is ideal for players with a naturally smaller frame. The duet of MP-90 single-coil pickups sounds absolutely massive when run clean or through your favorite fuzz pedal. And the Fender Mustang 90 solidbody electric guitar's electronics are an intuitive affair that allow you to focus solely on your music. The Fender Mustang is one of the most identifiable and sought-after offset electric guitar body styles in the world. Its compact dimensions not only imbue it with plenty of character, but also help it remain lightweight and extremely comfortable for smaller players. This Mustang 90 carries with it the standard Mustang 24" scale length that maintains lower string tension for easy chording and a warm, stringy tone. One look at the Mustang 90, and you'll know this solidbody electric guitar was built for today's boundary-pushing guitarists. The Mustang 90 separates itself from vintage Mustangs with a duet of Fender MP-90 single-coil pickups. Many players at Sweetwater agree the MP-90s are a great addition to the guitar because of the way they maintain the clear and bell-like tones of traditional Mustang single-coils, while offering more output and midrange grunt for players wanting to work their amps a bit harder. And the Mustang 90's 2-knob and 3-way switch controls make dialing in your tones a simple affair. Another aspect of the Mustang 90 that has been updated for the demands of today's guitarists is its neck. While this rosewood-on-maple affair does boast a vintage-style 24" scale length, the fretboard is designed with a 9.5" fretboard radius. Fender has been using this radius for a long time because it offers comfortable chording and unimpeded single-note playing and bending. The neck profile is a "C" shape that fills your hand in a very satisfying manner. And 22 medium-jumbo frets are a wonderful middle ground for all sorts of styles. Iconic offset design with a rock 'n' roll vibe 24" scale length is great for smaller frames Hardtail bridge maintains tuning stability 2 MP-90 single-coil pickups can snarl and sing Straightforward electronics package Comfortable 9.5" fretboard radius The Mustang 90 is perfect for players craving an offset style. Neck Shape C profile Radius 9.5"